Fenugreek commonly known as Methi is used as a spice in our Indian kitchens but do you know that the same Fenugreek seed is also extremely effective for your hair? This article is specially posted to tell you about the Treatment of Dandruff with Fenugreek – An Iconic Remedy. The methi seed is considered to be an ancient hair treatment ingredient as it has many rich nutrients and minerals including magnesium, sodium, and potassium. Fenugreek is a natural aid that treats most of the scalp and hair problems including scratchy irritating dandruff. Regular use of fenugreek seeds on hair helps in growing thicker and shinier hair with no scalp problems. This natural seed extract is also helpful in preventing split ends. The lecithin content in fenugreek helps hydrate the hair and strengthen its root. Note: The mucilage of the soaked Fenugreek seeds gives a conditioning effect to the hair. Finally, keep the hair healthy, strong & beautiful with our simple homemade recipes tips and for the busy bees check out the ready to use natural skincare and haircare products of Prakriti Herbals. 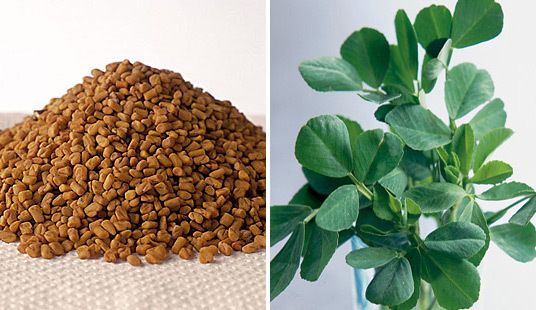 Fenugreek reduces hair fall,dryness and dandruff naturally!! Look no further than your kitchen for an excellent natural beauty aid for the hair and skin-Fenugreek! !Fenugreek seeds and leaves are obtained from a herb and are commonly called methi in India.Fenugreek means “Greek hay”,which presupposes its widespread use in Greek cooking .Although the seeds and leaves of this plant are used as a culinary herb, it is also known to cure many health problems and is an antidote for most hair and skin concerns as well. Fenugreek(methi) seeds are extremely effective and powerful seeds which reduce hair fall,dandruff and hair thinning and makes hair silky smooth. Fenugreek seeds replenish hair growth and are a good source of nicotinic acid and protein, niacin, potassium, Vitamin C,amino acids as well as diosgenin.Many scientists have confirmed that fenugreek contains a large amount of lecithin which is a natural emollient and make them healthy and strong. It also tones the hair, making it silky and shiny.The chemical composition of the seed shows it is rich in protein and amino acids thus moisturising the hair and reduces hair loss and dandruff. 1.Start your day with Fenugreek:Soak a tea spoon of fenugreek seeds (methi daana) in a glass of boiled water every night. Filter the water with the help of a sieve and drink it on an empty stomach every morning. Strain and drink this water every day helps in reducing hair loss.Make a paste of the seeds and apply to scalp.Cover with a showercap for 30 minutes and wash off with a herbal shampoo. 4. Anti Dandruff HairPack:A paste of methi leaves or seeds mixed with apple cidervinegar,when applied to the scalp is good for treating dandruff and dry itchy scalps. 5.Anti Acne Pack:Applying the paste of fenugreek leaves or seeds and turmeric on your face is very good for pimple and blackheads prone skin. Fenugreek works wonders on dry hair,becaue if its high mucilage and protein content .It softens your tresses and adds shine to dull hair. Moisturising HairPack:Soak fenugreek seeds in water overnight. Once the seeds become soft, grind them to a paste. Mix the paste with half its quantity of curd. Apply the pack to your hair and leave on till it for half an hour.Wash it off with a mild herbal shampoo . The result will be soft and silky hair you will love to touch. 8.Add volume and bounce to your hair: Apply a paste of fenugreek seeds to condition your hair while adding volume to it. This mask is a little messy but is quite worth the effort.Leave it on for 30 minutes and rinse it as usual with a herbal shampoo. Hence Fenugreek is truly a treasure trove of beauty…….do try out these time tested tips and feel free to share your experiences with us!! Based on the benefits of fenugreek , hibiscus, amla and coconut oil we have formulated our Nourishing herbal Amla Hibsicus Fenugreek hair oil – find out more about it on our facebook page .